As winter takes hold across Nova Scotia, fans of Propeller Brewing Company are bristling with the excitement that surrounds the annual release of the brewery’s Revolution RIS. The Russian Imperial Stout was released at the brewery this week and will make its way to NSLC shelves early next week. Propeller brews this unique ale true to its traditional roots; in the 18th century the English sent their brews via the Baltic Sea to the court of the Czars. To reduce the risk of spoilage Russian Imperial Stout was brewed to very high gravities and allowed to ferment on the long voyage. The result? A dark, strong and bracing brew. 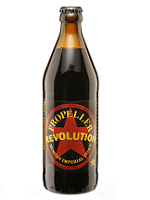 Propeller's version weighs in at eight percent alcohol by volume and boasts a deep, opaque black color. It has tremendous body and mouth feel, with intense hop bitterness, roasted malt and dark fruit notes. Propeller Brewing Company has brewed and bottled this robust ale each year since 2006. In addition to Province-wide availability in Nova Scotia, this year’s Revolution will find its way to British Columbia private retailers.